Hailing from the sleepy town of Logatec, Slovenia, Christian Kroupa had a music epiphany at a drum’n’bass party in 2008. In 2013, he surprised the Slovenian music scene with his approach to dark ambient music. 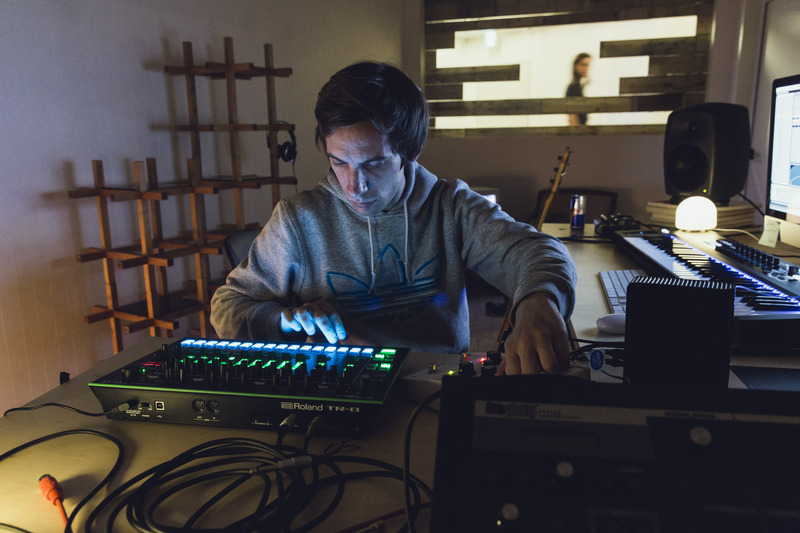 Since then, he’s proved his skills and innovation as a participant of the Red Bull Music Academy, performing at different stages (like Sónar in Barcelona or EMAF in Tokyo). He is currently working on new experimental, ambient music, but also keeping an eye on house and techno, making appearances on the legendary R&S Records and fabriclondon 90 mix with his alter ego, Alleged Witches. Can you talk about your musical beginnings? What is your first musical memory? My first musical memory would be driving to places with my parents as a 6, 7 year old kid. We would be travelling to different locations throughout the country, while listening to cassettes from Jean-Michel Jarre to Kraftwerk, also rock music like Dire Straits, Billy Idol, Def Leppard or even some reggae like UB40. Basically everything my parents, especially my dad, were listening to. Soon, I got my first Walkman and went through my parents’ cassettes and got my hands on Depeche Mode, Ultravox, Alphaville and other bands from the 80s. And it is still the music I enjoy the most. Later I started listening to more “serious” electronic music like The Prodigy or mixes from Richie Hawtin and Jeff Mills. But I was also listening to commercial music on MTV, of course, haha. Can you talk about the environment you grew up in – how did it form you creatively? I think the most important thing is that you are a part of an environment where you can access art or music. I consider myself lucky, I have parents who are quite into music so they introduced me to various kinds of music. I come from Slovenia, a town called Logatec, where music is referred to as something you’re listening to while driving, mostly just so you don’t drive in silence and mostly just commercial radio stations. So people don’t really come into contact with more serious stuff and their perspective on music is very different from mine. I grew up in a community where a lot of people from ex- Yugoslavia live, so I was exposed to diversity but I wasn’t that much into alternative culture, except listening to music. What I did was playing football all the time. Where are you based and how is the music scene there? I’m still based in Logatec, but mostly just because this is where I make my music and hang with my friends whom I’ve known for ages. But I spend quite a lot of time in Ljubljana, where the mentality is very different to my hometown, though there is just 30km difference between the cities. I don’t want to sound negative, but even in Ljubljana the scene is not really that great. One problem is that the scene should give something to the people, a contact with something. But here, I think the scene is just for the existence of itself. Just so something happens and that is it. With no greater purpose. Neither to show something different to people, nor to get people into music or DJing. The private clubs are there just to make profit. The guys who get the money from the government just don’t want to lose too much of what they get. There are many people here who are doing great stuff, but the scene just isn’t doing them any favours. It should be there to give you a hand, have you noticed, even abroad. But we are in this bubble where everything looks fine, but the reality is that time is just passing us by. You started producing in 2008, after attending a party. What was the impulse that lead you to it? You also have various guises – from ambient to house/techno. That is right. It was a local drum&bass party and I don’t know how, but I just got into that state of mind where I said, wow, I want to do this. Not to DJ, but to make music. After a few years I got my first gigs, so I was also stoked about playing music to other people. I still am. It gives me goosebumps. I look at it as a privilege. That something hits you at the age of 18 and suddenly you know what you want do to with your life. A lot of people I know still don’t know what they want to do. I think it’s just something you have in you. Not really as a job, more like a religion. Here is music and then there is everything else. At least in my case. Sure, it changes with time. But at the core is still the passion, devotion and love. I just do what I do. Also a lot of drum&bass or experimental, ambient stuff. You can’t really be into making just house or techno all the time. I rather write an ambient track, than waste my time drinking beer and waiting for the inspiration to strike me. I find my inspiration while making music. When I make house, I find inspiration for ambient and vice versa. Can you talk about your other project, Alleged Witches? It all started in 2015 when I wrote a track with some tribal samples and decided to name it Alleged Witches. Then I did a few more similar tracks and decided they will become part of my project called Alleged Witches. Quite fast I also realised they are much more specific than the stuff I did under my own name. The tracks also became much more complex, sure they are repetitive house tracks, but the percussion is quite complex. I got obsessed with searching for the right sample, the right kick drum, clap, chant, flute, etc. There is more or less 50 different sounds in each of the Alleged Witches tracks. And the Alleged Witches tracks are basically some of the rarest tracks I can easily say I feel proud of. Not all of them, of course. Because most of the tracks I make are nothing special. After a while I started sending them to artists which I adore and they gave me quite a positive feedback back then – from Ben UFO, to Midland, Alexander Nut, R&S records gave me a chance to do a remix for Alex Smoke, Scuba used one of the tracks in his Fabric 90 mix. So everything became much more serious and Alleged Witches became my priority project. Is the occult and mysterious something inspiring to you? Most definitely. I think it is also about the times we are living in. It is like as if were sleeping for the past couple of years and suddenly woke up and saw that things are not what they seem. Suddenly, the world is also a dark place. And darkness can be a perfect inspiration for making art. There is also a struggle between what to believe, what is real and what is not. I’m quite into spiritual matters and philosophy, so I ask myself about death and the afterlife, what is my purpose, where do we come from and it just happens that these things feed my inspiration, probably somewhere from my subconscious. It is all about feelings. I just know that reading about the occult, black magic, mystery and voodoo gives me goosebumps. Reading about the Kardashians does not. How do you make music in terms of the process and execution? Depends on the genre that I’m making, but as said, it’s all about emotions. If I do stuff under Alleged Witches, it’s all about the drums at least at the beginning, then the pain kicks in, when you start digging for the right vocals or flute, etc. I know a lot of artists have an idea in their mind, then they just transfer it into the beat, melody. I can’t do that. I need to sit down and start playing around. Make some loops and go on from there. Some tracks have quite a lot of different sounds in them, so it can become a nightmare when you start arranging the sounds. But if the collected sounds are cool, the arrangement just comes by easily. But this happens about two times out of ten, haha. I try to finish everything anyway. It is better than to have it sitting unfinished on your computer. Finishing stuff is a process of itself. Making a track from four second bars can be tricky. You have to keep it interesting for yourself and keep the track interesting as well. People ask about how long it takes to finish or make a track… 5 hours? 1 day? 3 days? It takes an entire life. You maybe got the skills in the past few years, but it took you your entire life to arrive to this moment. What are you currently working on & planning? The same as always. Get up in the morning and start making music. Sometimes something comes out of it, sometimes it doesn’t. But you never know when it will happen, so you have to catch the right moment. It is like, I don’t know what I’m searching for, but when I’ll find it, I’ll know this is it. Recently, Alleged Witches’ Serve The Spirits 12inch EP came out on Meda Fury, which is a sub-label of R&S. Need to say, big thanks to Nick Williams for believing in these tracks and putting them out. The newer Alleged Witches material should be out at the end of this year, not going to say where, but I’m really glad it is happening. Don’t know what I’m going to do with the stuff written under my own name. I have quite a lot of material but as said, Alleged Witches is a much more specific project. I do a lot of different stuff, so I should really decide what to do with it. But I guess this will happen naturally. The plan is to make music that makes me cry or dance to it. And play as many gigs as possible, because I really love playing music to other people.